Sigh, how do people manage to do everything? This efficiency thing, I shake my head. It's totally been awhile 'round these parts, because I forgot how to log on here, AGAIN. And then also, it's getting to me that this version of movable type is like a dinosaur, and not even a cool menacing (but soft-hearted) dinosaur that lays eggs made of chocolate. This is a review of the Múm concert I went to a few weeks ago with Robyn (who took that thar picture) and her friend. Why is that picture so small, you may ask? Well, it's a little-known fact (ha!) that this was a concert for lilliputians. Just kiddingggg. You can't be Icelandic AND lilliputian. So I don't know how to use flickr! Give me a dinosaur egg of chocolate! 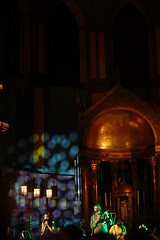 This was part of the Wordless Music series — it was in a church! Oodles of acoustic-y goodness, for Múm, at least. I kinda dug Torngat, whose cds got held up at the border. Between Canada and the US. Maybe the border guards got mad that their money is the equivalent of ours. And took it out on music with french horn and trumpet. Tra-la-la. Or Trà-là-là. Whatever. Jihyun Kim played the first Bach cello suite and a Ligeti cello sonata. I was a little apprehensive about the Ligeti because we sang one of his pieces in choir once and it was scary, like fingernails on chalkboards. He is probably most well known for his musical work on some Kubrick films. Scary! But this piece is actually pretty cool, I think. Except it kind of disappeared into the air at the church, barely hit the high ceilings, and came back to my ears as soft mush. Baby food of music. I found a video of her playing the same piece. Kind of awesomely impressive. So I wish her stuff had been clearer at the performance. Oh well. And then we got Korean food. That should be the ending for all days. Including life. "I died, and then we got Korean food."